One of the earliest behaviors we develop as kids is the art of doodling on blank sheets of paper. We are naturally drawn to this medium – to express ourselves, to create something out of nothing, to share our experiences and imagination. Art is a human force within us, always waiting for an outlet. In that sense, we are all artists. Yet, the concept of getting engaged with art has become so mixed up and straight-jacketed with societal and hierarchical constraints today that our experience of it is no longer as exicting as it was as kids. Despite our innate tendency towards arts, why do we feel so disconnected from it? Look at the contemporary art scenario in India. Despite the fact that this is perhaps one of the most thriving decades for arts in our country, this experience is not extended to a large section of the populace. Our art has not reached the masses. That it stays confined to a few in the corridors of our museums and galleries inhabited by the elite, while many young artists still struggle to make their mark, is a commonly known fact. But it would be wrong to pass the judgment that this is simply a case of lack of awareness or apathy amongst the masses. Talk to global travellers from India and you would normally find the best of museums on their itinerary – from the Smithsonian in Washington D.C. to The Louvre in Paris. A visit to these cities would not be complete without a trip to these iconic institutions of art. The same unfortunately does not hold true for a city like New Delhi, which itself is home to some of the finest museums in the country. This is not just because of a lack of museum-going culture amongst the citizens, but also because our museums have not focused on creating the type of allure and excitement that global museums in the US or Europe have been able to establish. A day in the Smithsonian is an exhilarating, immersive experience for children and adults alike. It not just brings people in, but also engages them with exhibitions, activities, ongoing dialogue and technology-driven initiatives. This experiential exchange is critical to inculcate a sense of exploration towards art. At the same time, many art collections in India are still locked up in private galleries. This largely restricted access to arts in the country has long hampered the development of interest by creating an unreachable niche, considered to be exclusively for those who can “afford” the art. This scenario is slowly changing with a few individuals and institutions philanthropically opening up their private collections for public viewing for free. And even creating museums where people can come and learn more about the art and artists and develop a stronger and deeper taste for the arts. This philanthropic view of art and culture in India is relatively new. And perhaps one of the most profound changes that will help evolve the landscape and instill the beauty of art and culture into people’s lives. As a society we stand to gain immensely from these philanthropic endeavors in art and culture landscape because art helps us develop a richer understanding of life itself. For individuals, art is a medium that brings us closer to ourselves by encouraging curiosity and reflection. For the society, it offers a shared understanding of the things that bind. In that sense, art has a strong role to play in building social bonds and connections, bringing us closer to humanity. Imagine if we could bring this connection alive and nurture it from a young age, right from childhood, when we start our tryst with art with a crayon in hand. 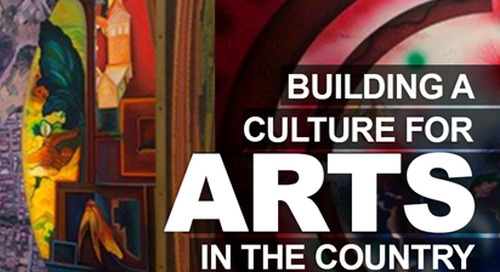 This means elevating the status of arts in education – from a mere lecture or extra-curricular activity in school to an essential ingredient of curriculum. We need to build spaces where children and adults alike can immerse in the experience, places where art is not placed on an elevated pedestal but thrown open for the curious and thoughtful minds. In India, philanthropic museums and art institutions are now working in this direction. They provide access to senior artists and curators who have invaluable knowledge and insights. Educational discourses and symposia at museums help in bringing this knowledge to the general public and build appreciation and understanding of the nuances of art. Workshops are used to stimulate interest by actively encouraging participation and creative thinking. Once again, museums are helping build art programs and creative teaching tools to get both children and adults to think creatively and engage with arts. Outreach programs are effective in taking art out of the confines of a museum and right into our schools, colleges and communities. Plugging the societal need for engagement in the arts would inevitably bring further visibility for artists. While at the same time building a platform for young artists to network, study and further develop their art by interacting with experienced and seasoned minds from the sphere. Our lives stand to gain so much from nurturing this passion and interest in arts and culture. It is a form of expression that never truly leaves us, we just forget how to tap into it. As children we learn how to communicate with ourselves before we learn how to communicate with others. Our imaginations fuel us and our drawing books carry our stories. Perhaps, losing that sense of wonder and curiosity is one of the biggest losses we can experience in life. And just looking at a piece of art can help bring that wonder back to life.